The former New York Mayor, who became recognised worldwide following 9/11, has yet to declare his intentions but appears popular amongst Republican voters. Rudy Giuliani speaking at a public rally in the US last year. SOMEWHAT SURPRISINGLY, A new poll of potential Republican presidential candidates for next year’s election has found former New York mayor Rudy Giuliani as the most popular choice, despite the failed 2008 candidate not yet declaring his interest. The poll results, released on Friday, found Giuliani top of the pile with 16 per cent support, trailed by Mitt Romney on 15 per cent, and Sarah Palin on 13 per cent but the poll also found that 28 per cent of people were “not very satisfied” with the candidates in the Republican field. Giuliani ran as a candidate in 2008 but failed to secure the Republican nomination after running on a strategy of not campaigning in the important early primary states of Iowa and New Hampshire. He came to national prominence following the 11 September attacks where his leadership during a time of great upheaval and tragedy for New York was widely praised, earning him the title ‘America’s Mayor’. Although he has yet to decide on a run in 2012, Giuliani has made a string of public appearances recently and will speak in the key early voting state of New Hampshire next week at a state fundraiser for the Republican party, Reuters reports. In the poll, there was support for candidates who have so far shown little intention of entering the field. These included Congressman Paul Ryan, who is the chairman of the influential congressional committee on budget and has introduced his own alternative budget for the US. New Jersey Governor Chris Christie also garnered a large amount of support but he has so far ruled out entering the already crowded field which includes former Massachusetts governor Romney, and former Speaker of the House Newt Gingrich. Ruling himself out is Donald Trump but not ruling herself out and perhaps even counting herself in shortly is the 2008 vice presidential nominee Sarah Palin. The controversial former Alaska governor is set to declare her intentions shortly with moves afoot to beef up her campaign team and release a feature-length documentary entitled ‘The Undefeated ‘, which would be a positive portrait of the defeated 2008 Republican vice presidential nominee. Email “Former New York mayor Rudy Giuliani tops poll for Republican presidential candidacy”. 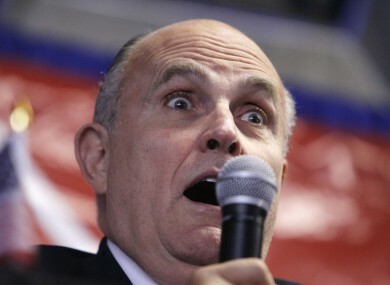 Feedback on “Former New York mayor Rudy Giuliani tops poll for Republican presidential candidacy”.